Ashwagandha is a very famous herb in Ayurveda, and it has become famous outside of India after Korean ginseng became popular some years ago. 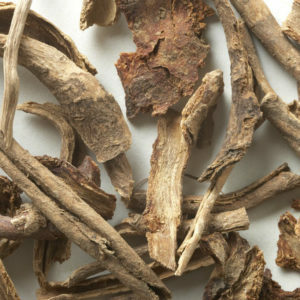 Ashwagandha has similar adaptogenic properties as ginseng. It helps you deal with the elevated pressure of more and more stress in life. Ashwa mean horse in Sanskrit, and gandha mean smell. This can be taken literally because the secondary aroma of ashwagandha is very much like the smell of a horse. But on a deeper level, Vaidya Mishra interprets the word gandha to mean character, or essence—the smell of something can be thought of as the intrinsic character of that thing. Ashwagandha gives you the character of a horse in many ways. Horses are able to adapt to increasing levels of stress. Race horses are trained to run faster and faster. The reason people race horses instead of other animals is that horses are able to cope with this constant increase of stress. As horses can handle a great load of stress, ashwagandha helps to you to gain the same ability; it gives you the stamina of a horse—physically, mentally and sexually. It helps you win the races that life gives you. These are the properties of the herb, and you can see that they fit nicely with the meaning of the Sanskrit name, ashwagandha. 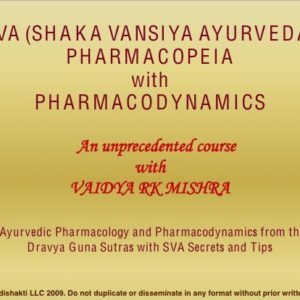 In this 32 minute audio lecture, you will learn five other Sanskrit names for ashwagandha which are useful when studying the Ayurvedic texts or when identifying the herb in the wild. Ashwagandha, like most of the herbs described in Ayurveda, has many synonyms, and each name brings out a different quality of the herb. These names also help you to remember what ashwagandha does. You will learn eight prabhavas (special properties) of ashwagandha and how to take advantage of those properties without aggravating the doshas (vata, pitta, kapha). You will also learn about the physical properties of ashwagandha, the rasa (taste), guna (qualities), virya (potency), and vipak (post-digestive effect), which are essential to know if you want to use the herb without causing imbalance in the process. Ashwagandha is a very valuable herb, but it should not be used as a blanket treatment for stress. 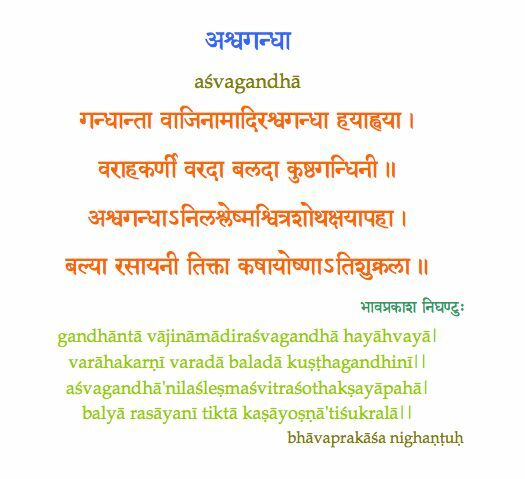 When you study this Sanskrit verse with Vaidya Mishra you will understand how to use ashwagandha in a balanced way, and how to know when to avoid using it. You will also learn which of the seven dhatus (tissues) this herb nourishes and strengthens. Ashwagandha is an ingredient in many of Vaidya Mishra’s herbal formulations. Here is a list of the main ashwagandha products. Does not have to go through the digestive, metabolic or liver system which could corrupt the herb’s intelligence. Strengthen the mind by delivering the balya prabhava (strengthening quality) of ashwagandha to the brain transdermally (through the skin). Receive the benefit of this herb without overwhelming the body with it’s ushna guna (heating quality)—important for the high-pitta physiology. Bypass the liver and digestive system (if these are weak, or toxic, they can corrupt the herb or prevent it from being fully utilized). Enjoy continuous absorption through the skin for several hours (such as when you sleep). Good for kapha and vata people, that don’t need to worry about the ushna guna (heating quality).